As I sit here in my pajamas (yes, I have been in my pajamas all day), I realize that I need to remind myself at times that I still am recovering. I don’t need to dwell on it but a reminder every so often is a good thing. Let’s just do a quick recap. I returned to work in September. Super excited. Go big or go home attitude back. Ramping up my work hours each week. After a few weeks, my weight began to plummet and I had to cut back in October. It was a hard thing to accept but necessary. Since then, I have maintained a work schedule of about 15 hours a week until this month. During the month of December, I returned to the gym a few times a week with minimal issues. I was increasing my activity, eating well, feeling well, and maintaining weight. End of December, my job duties changed as I was now managing two physio clinics as well as working my usual clinical hours. I continued working out at the gym and even managed to attend 3x a week for a week. The first week of January was running really well. As the weeks progressed, I was more and more fatigued each night. But I didn’t want it to affect my life so I just kept pushing through it. I figured it would pass. On a side note: a funny thing about working is that I feel energized by the people around me and as well as my patients so I don’t feel the fatigue for the most part. I’m invincible. It’s when the adrenaline rush slows down and I relax, I realize that I am actually pretty tired. So after going big for the past few weeks, I finally decided it was time to spend time to relax and decrease my activity for the next few days. I think it really hit home when I looked in the mirror and noticed I was looking quiet pale. Resting was a tough thing to swallow (pun intended!) but I actually feel human again. This was a reminder that I’m not quiet there yet. Yet being the key word. The fatigue I experience is unlike any fatigue I have felt before. When it’s bad, it feels like you have pulled an all nighter for two nights in a row. Your eyes burn and every morning when you wake up, it feels like your head is still in the clouds. You can push through it and function normally but it just seems to build up if you don’t rest. It is frustrating to feel like you can do everything but your body can’t keep up. But I cannot dwell on this fact because that won’t get me anywhere. So this is where the mental part comes in. I watched a good video by Dr. Mike Evans discussed the 90:10 rule in one of his educational videos about managing stress. He said that 10% of our life is what happens to us and 90% is how we respond. I am a firm believer in this statement and it really hit home as it relates to everything CDH1 for me. Even though I am not physically as strong as I was prior to surgery, I can say with 100% confidence that I am more mentally strong than I have ever been. I was a positive person before surgery and I can say I am even more positive than I was prior to surgery. I choose to respond positively to most things that have happened to me over the past 8.5 months and in turn, everything has followed suit. The big things that used to stress me out in the past are now just little things. 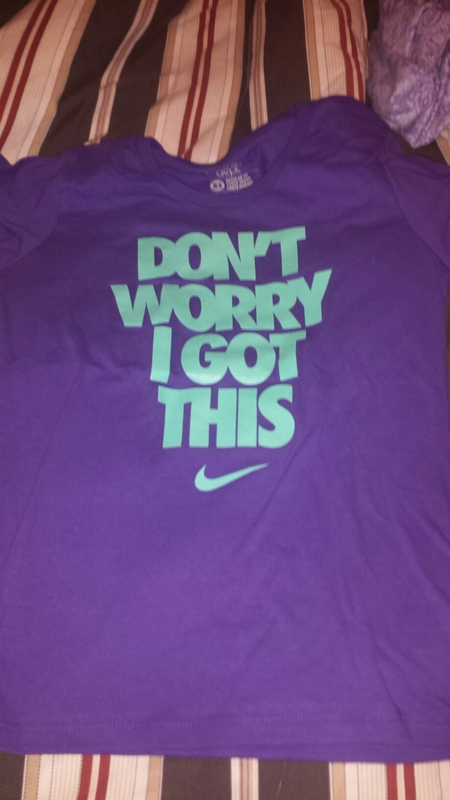 I found a t-shirt at Nike that read “Don’t worry, I got this” and I had to buy it. It just about sums up how I have been living my life since surgery. So tomorrow I will continue with the CDH1 saga. I am starting my screening for breast cancer (mammogram and MRI) because I’m high risk. Screening is always a little scary. But don’t worry, I got this.